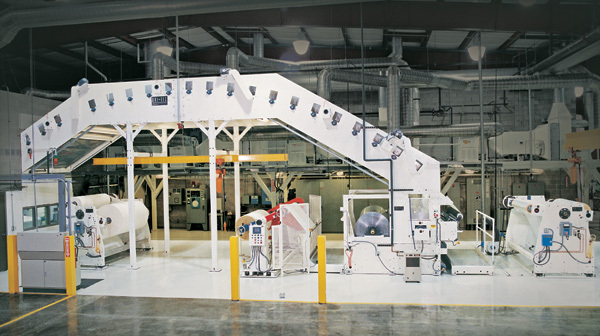 Inline Systems — Dominion Technologies Group, Inc.
Dri-Tec’s inline coating and laminating stations are engineered to compliment and increase production versatility with new or existing companion equipment. These field proven inline systems precisely match the existing control parameters of the press and are capable of handling all multi-function production requirements which include registration, tensions, velocity, position and temperature control etc. Dri-Tec’s field proven servo web handling, position and registration control technology has developed into the most versatile and reliable production equipment available to meet present and future production requirements such as statistical process control. The system also provides the advantages of online communications and modem diagnostics for speed of life customer service response time. This inline coater/laminator station is designed to coat a secondary web, laminate to the primary and finally deliver the web back to the companion equipment’s existing rewind unit. By combining printing and laminating into a single process, costly out of line individual processing is avoided and higher more efficient production is achieved. NOTE: We will be happy to consider special configurations based on your specific needs.